Discuss the impact Archbishop Cranmer’s Book of Common Prayer in 1549 and English Prayer Book in 1559 had on Anglicanism and all of English-speaking Christianity. Discuss the liturgical legacy of Evensong on Western Christendom. A great Cliff Notes version of the Christian message. In some ways it may have had a bigger influence than the English translation of the Bible. The Bible can be challenging due to not only it’s length, but content that requires scholarship or commentary to fully understand the various nuances that could be easily misunderstood which was a fear of the church and political leadership. The Prayer Book did an amazing job of not only simplifying message and theology to be easily understood by the common man, it also wrapped it in the language of poetry so it can resonate and be reinforced emotionally as well. Truly great hymns not only entertain, but their lyrics teach as well. Set to music like a catchy jingle they are more easily recalled. A great testament of how influential and far reaching the Prayer book is that it is recognizable outside of church in the secular world. Many works outside of the official Bible has value, able to educate and influence the believers for the better. 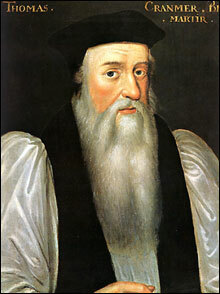 The Archbishop of Canterbury Thomas Cranmer was appointed in 1533 to formalize King Henry VIII’s annulment from his first wife, Catherine of Aragon, so that he could marry Anne Boleyn. He, along with the royal minister Thomas Cromwell, instigated a piecemeal dismantling of the old Church. 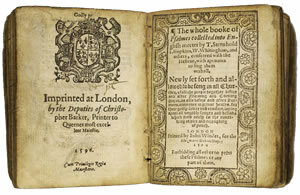 Though he is well known for this, one of his greatest and lasting legacies he left for the Reformation and the English Church during the reign of Edward VI was the Book of Common Prayer in 1549, then revised in 1552, which was used for the vernacular liturgy in the English Church. It was the first prayer book to include the complete forms of service for daily and Sunday worship in English. It contained liturgical prayers for Morning and Evening prayers, Holy Communion, orders for Baptism, Confirmation, Marriage, prayers for the sick, and funeral services. In it he included more conservative Lutheran forms of worship that were recently devised in Germany. In addition, his Prayer Book left one liturgical legacy to all of Western Christendom: an evening service known as ‘Evensong’ that is now most regularly performed in Anglicanism. MacCulloch heaps praises upon Cranmer’s use of prose when composing these short prayers in the Evensong. This work has proven so useful and popular that it has even been used in Protestant and Roman Catholic services as well. It is quite ironic that the Evensong is performed regularly by choirs in Anglican cathedrals today though in his life, Cranmer detested cathedrals and elaborate church music. (loc. 12228) Nevertheless, Cranmer’s Prayer Book handed down to first England and then the rest of the world, a lasting liturgy that has affected much of church worship till this day. The Anabaptist (or rebaptist) movement started early in the Reform era. It was seen by its adherents as a logical step in Zwingli’s reform. It held that baptism required the ‘conscious act of faith by the person baptized.’ (MacCulloch, p. 622) As such, ONLY adults (i.e. mature persons) qualified, so NO infant baptism was allowed or valid. Christianity REQUIRES a fully conscious free will decision to join which an infant or child does not possess. The NT rarely uses the term baptism alone. Instead uses the phrase/concept ‘repent and be baptized’ fusing the 2 actions together. An infant/child has no idea what repentance is or what to repent for. If infant baptism is cogent i.e. sufficient for God, then what is baptism? What does it do? Is it tantamount to a magic spell which gets you saved? Is not a free will choice necessary to love and accept God? Even Judaism, following the OT, baptizes only when the child is mature/enters adulthood. Today I have modified my view on infant baptism. I no longer see it as wrong but do not see anything gained by it. I firmly hold that somewhere and somehow each individual MUST make his or hers cognizant, free decision to follow God and choose to become a Christian. If I had a child I would not baptize him or her. I would educate, especially by example, and encourage them to make their own decision to love and accept God. I observe, in closing, that it seems odd to me that Roman Catholicism requires the Sacrament of Confirmation. What are you confirming? Is it not your baptism? So is this not an implicit admission by that Church that all persons NEED to make the decision for themselves and when they are capable i.e. mature enough to do so? The Catholic Church had long proclaimed that the church was an institution. The word “church” to them had come to represent the organizational structure that was the Catholic Church. Tyndale’s translation was seen as a challenge to this doctrine because he was seen to have favored the views of reformers like Martin Luther who proclaimed that the church was made up and defined by the believers, or in other words their congregations. When Tyndale decided that the Greek word εκκλησία (ekklesia) is more accurately translated congregation he was undermining the entire structure of the Catholic Church. Many of the reform movements believed in the authority of scripture alone. To them it dictated how the church should be organized and administered. 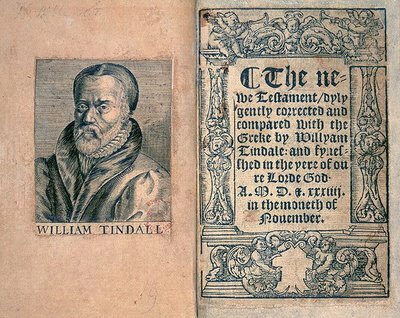 By changing the translation from church to congregation Tyndale was providing ammunition for the beliefs of the reformers. Their belief that the church was not a visible systematized institution but a body defined by the believers themselves was now to be found directly in the Holy Scripture. Furthermore Tyndale’s use of the word congregation attacked the Catholic Church’s doctrine that the lay members and clergy were to be separate. If the true church is defined as a congregation, as the common believers, then the Catholic Church’s claim that the clergy were of a higher order than the average Christian and that they had different roles to play in the religious process no longer held sway. Tyndale’s translation of the Greek word πρεσβύτερος (presbuteros) to mean elder instead of priest also challenged the doctrines of the Catholic Church. In particular, it asked what the role of the clergy should be and whether or not they were to be separated from the common believers as they were in the current Catholic system. The role of the priest in the Catholic Church had been to lead religious sermons and ceremonies like mass, to read the scripture to the people, and to administer the sacraments. They were considered separate from the common believers. In many reform movements a group of elders would lead the church and take the place of the Catholic priests. These elders were not a separate class from the common believers, but in fact, they were usually selected from amongst them. Many reformers believed in the idea of the “priesthood of all believers,” which meant that every Christian was in fact a priest and had the right to read and interpret scripture. Tyndale’s translation stripped away the scriptural basis of Catholic clerical power. Priests no longer administered the church: it was the job of the elders, which implied that the power rested in the hands of the people. Catholic doctrine was also challenged by Tyndale’s translation of the Greek μετανοείτε (metanoeite) as repent instead of do penance. This translation attacked the Catholic sacrament of penance. This translation attacked the Catholic sacrament of sacramental penance. Generally speaking most reformers believed that it was through faith alone that one was saved. This differed from the views of the Catholic Church, which followed the belief that salvation was granted to those who lived accordingly to what the church told them and thus participated in the seven sacraments. Tyndale’s translation challenged the belief that one had to do penance for one’s sins. According to Tyndale’s New Testament and other reformers, all a believer had to do was repent with a sincere heart, and God would forgive. The believer did not have to earn salvation; it was given freely by God. All one had to do was believe in his promise and live accordingly. The Tyndale Bible also challenged the Catholic Church in many other ways. The fact that it was translated into a vernacular language made it available to the common people. This allowed everyone access to scripture and gave the common people the ability to read (if they were literate) and interpret scripture how they wished, exposing it to the threat of being “twisted to their own destruction, as they do the other scriptures” (2 Peter 3.16) instead of relying on the church for their access to scripture. The main threat that Tyndale’s Bible caused to the Catholic Church is best summed up by Tyndale himself when he tells us of his reason for creating his translation in the first place. Tyndale’s purpose was to “[cause a boy that driveth the plough to know more scripture] than the clergy of the day,” many of which were poorly educated. Thus Tyndale sought to undermine the Catholic Church’s grip on the both access to and interpretation of scripture. They were no longer needed as intercessors between the people and God.